The Grand Avenue Festival is held during the months of May and October on Grand Avenue between Centre City and Juniper. 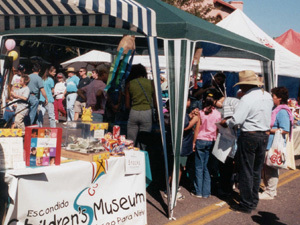 The festival is sponsored by the Escondido Chamber of Commerce and the Downtown Business Association. For more information, contact the Chamber at 760-745-2125 or visit their website. For vendor information, please call Keith Kennedy & Associates at 760-945-9288.